We have all been in situations where we start working in one area only to realize that we have left an important tool on the other side of the jobsite. The best way to avoid problems like this is to always have your tools on yourself at all times. Of coarse this is not always possible because of size and weight limitations. Say bye bye to this problem forever with the new DogBoss tool transport system. Now all those extra tools that you just don't have room for, can be kept on mans best co-worker. The DogBoss can be easily adjusted to fit most larger dog comfortably, allowing them to carry up to 40 lbs. of tools. 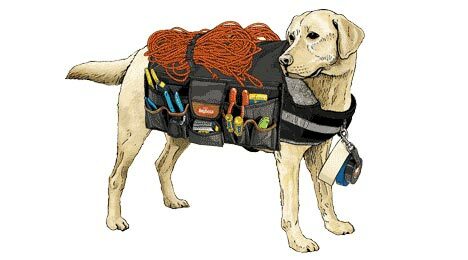 Keep one of your tool bags full of dog treats and you will have one loyal happy co-worker. The DogBoss is available exclusively at [:cicn:]Duluth Trading for $49.95, and comes with a training manual and DVD.